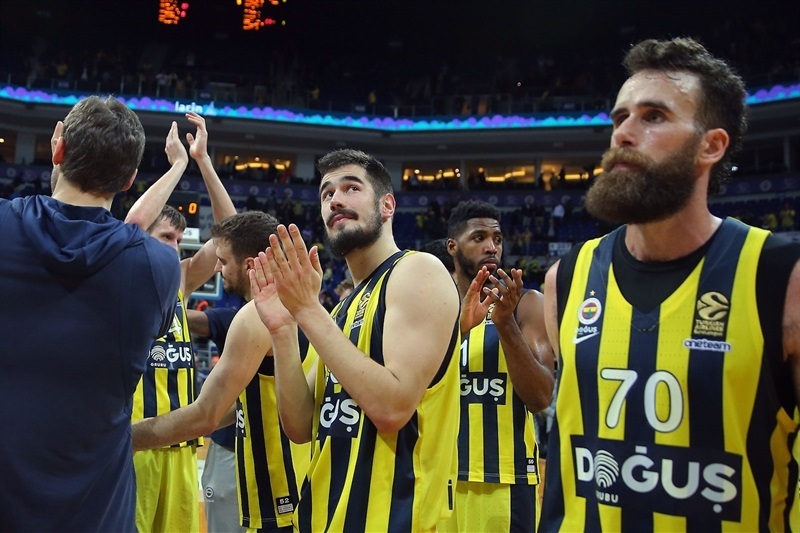 Fenerbahce Dogus Istanbul busted out to early leads and followed an inspired Jan Vesely to a 77-69 victory over visiting Brose Bamberg on Friday. 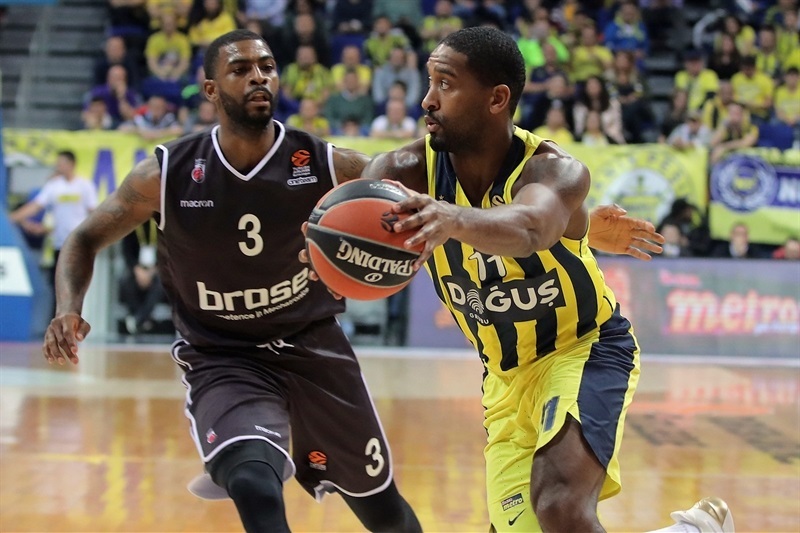 Fenerbahce raised its second-place record to 15-7 while Brose dropped to 8-14. 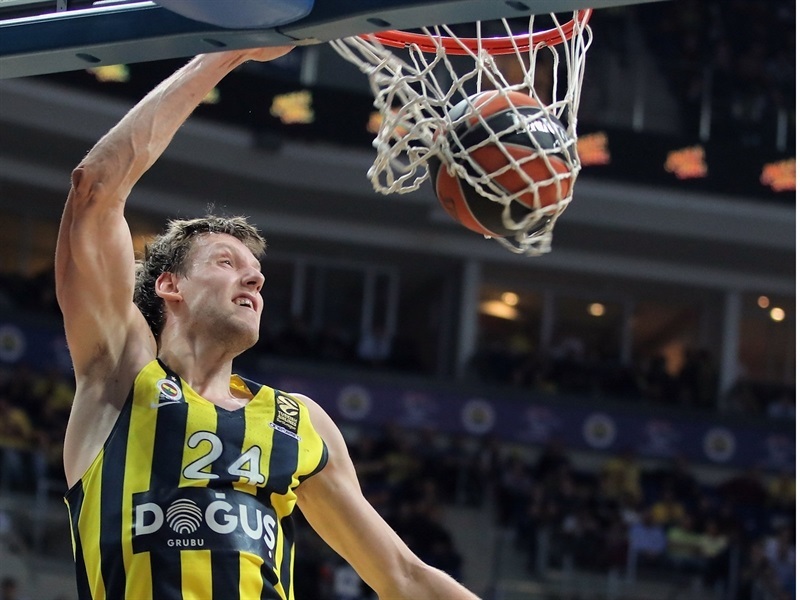 Vesely was the game-long catalyst for the winners, finishing with 26 points and 11 rebounds. It was the second-best scoring night of his career and led to his career-high index rating of 36. 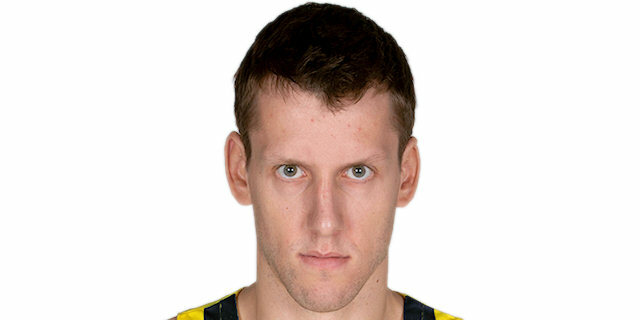 Vesely made 9 of 12 two-point shots and 8 of 10 free throws. 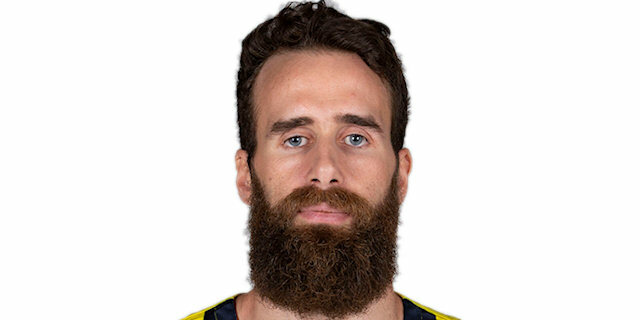 Fenerbahce's other double-digit scorer was Marko Guduric with 10 points and no shots missed, while Brad Wanamaker scored 9 to go with 5 rebounds, 5 assists and 3 steals. 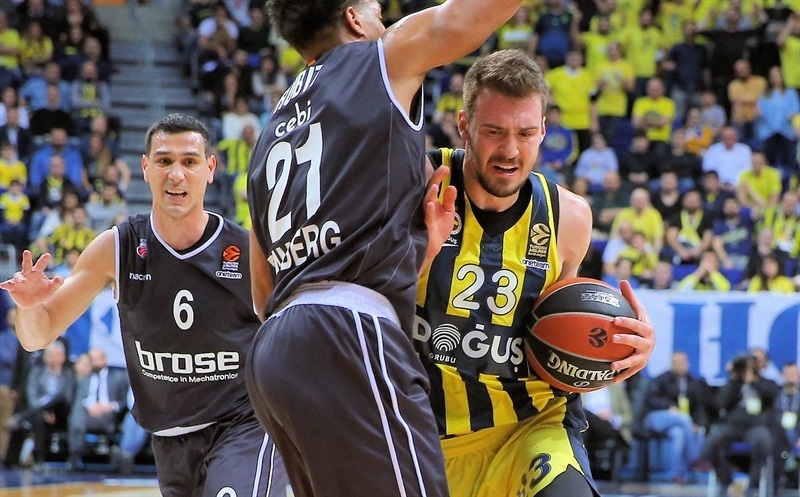 Fenerbahce led by a high of 17 points, 52-35, midway through the third quarter, but Dejan Musli had 13 of his 18 points for Brose after that to get the guests within 8 points with 5 minutes left, but no closer. Daniel Hackett added 11 points and Ricky Hickman 10 in defeat. Ahmet Duverioglu scored twice inside before Guduric dunked on the break and then drove for a three-point play at 9-3. Bamberg's fourth turnover already was converted into a fastbreak layup by Melih Mahmutoglu. Dorell Wright finally hit Brose's first field goal, a runner, after 6 minutes to make it 11-5. Free throws from Louis Olinde and Dejan Musli lowered the difference before Daniel Hackett's triple made it 12-11. Wanamaker answered with a layup, but Hackett's turnaround jumper left a 16-13 score after 10 minutes. Hackett picked up where he left off, swishing a long two, while Vesely spun for a layup. Luigi Datome hit free throws at 20-15 that Patrick Heckmann answered from the corner. 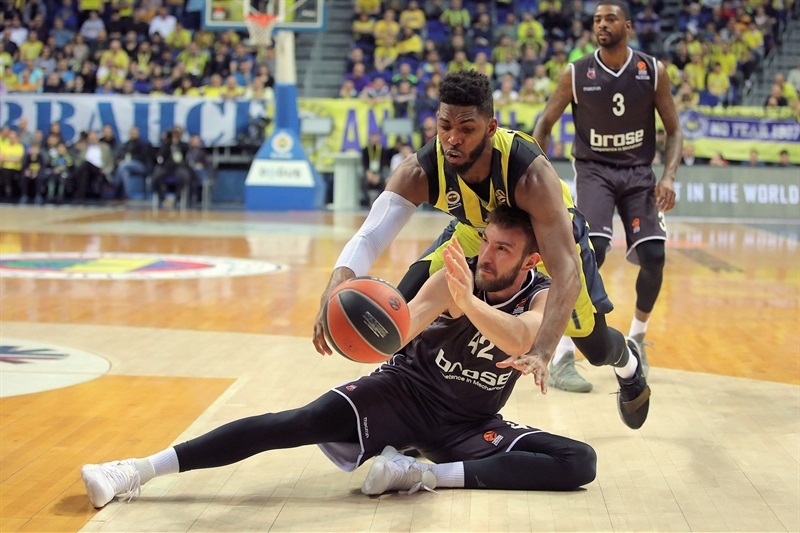 Jason Thompson and Kostas Sloukas joined the Fenerbahce scorers before Musli scored twice as the visitors pulled within 26-22. Datome struck from downtown and Vesely dunked a pair of misses for the first double-digit lead, 33-22. 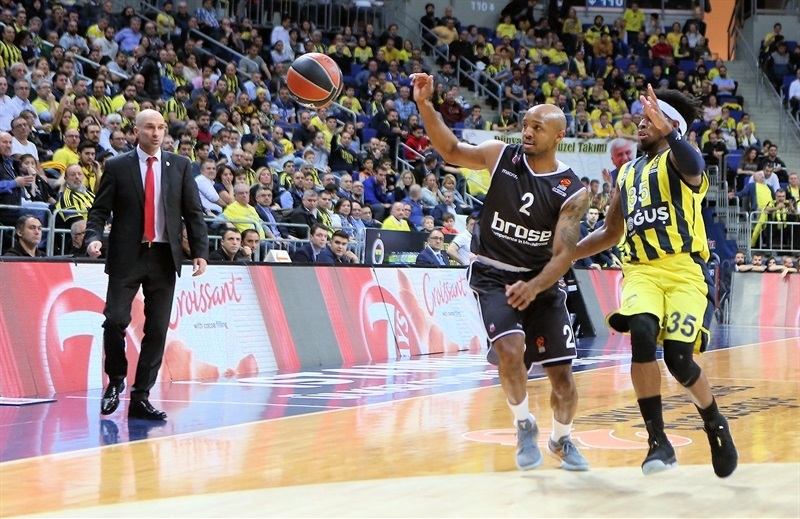 Melli and Vesely stretched that to 37-24 with free throws before Ricky Hickman drilled a three-pointer for Bamberg. Sloukas danced through the visitors' zone defense for a layup before Bamberg's Nikos Zisis hit from deep and Wright beat the buzzer with a one-legged runner for a 42-32 halftime score. Wanamaker and Guduric stretched the lead right after halftime as Brose against waited more than 2 minutes to score on a Hackett layup at 46-34. 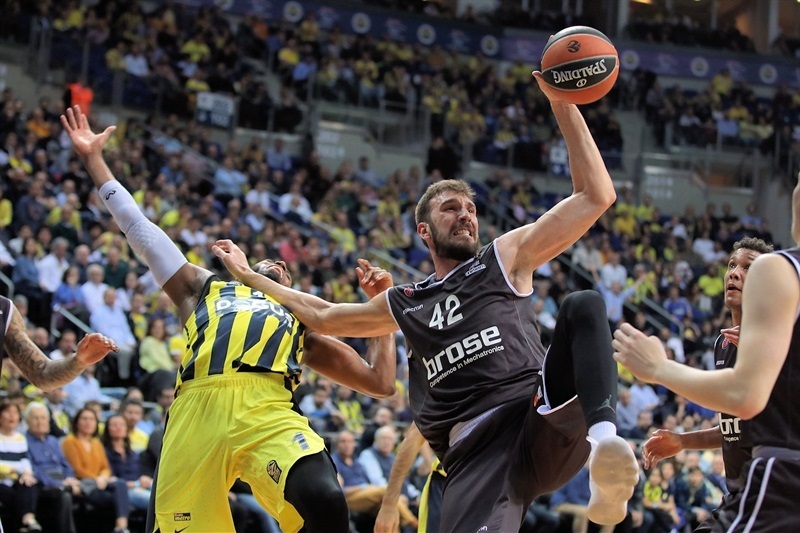 Vesely and Wanamaker made it the biggest lead so far, 50-34, before Augustine Rubit, the Round 21 MVP, got his first point at the foul line. Lucca Staiger made a three-pointer and Musli scored inside to make it 52-40. 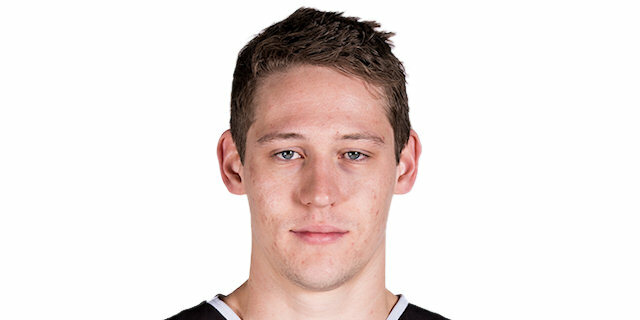 Guduric responded from long distance and Aleksej Nikolic made free throws and a jump shot as Bamberg inched closer, 55-45. That was too close for Melli, who scored inside, and Ali Muhammed, who drilled a triple to make it 60-45. Hackett's put-back and a free throw by Nikolic left a 61-48 difference after 30 minutes. Wanamaker started the fourth-quarter scoring but Musli's three-point play and a layup by Nikolic got the difference down to 63-53. Musli's next three-point play meant a single-digit difference, 65-56. Then Musli answered Nikola Kalinic's triple with a pair of baskets to make it 70-60. 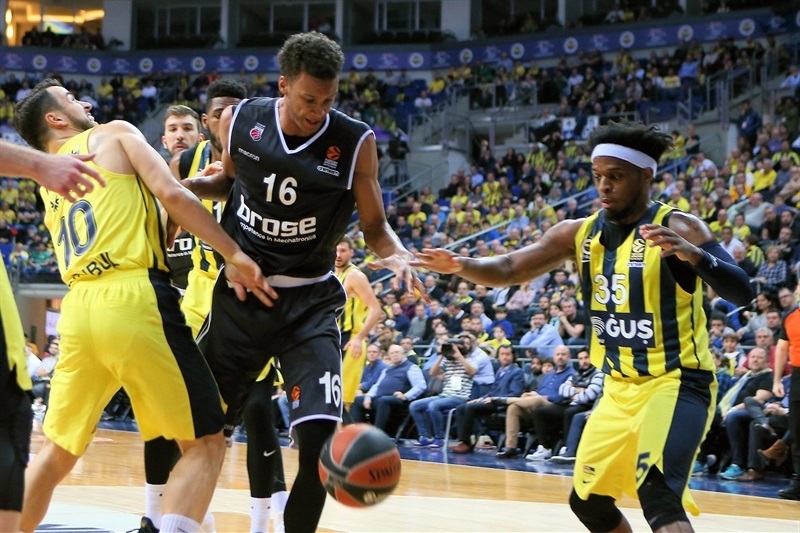 Hickman's running one-hander came next, forcing a Fenerbahce timeout, with 5 minutes left. 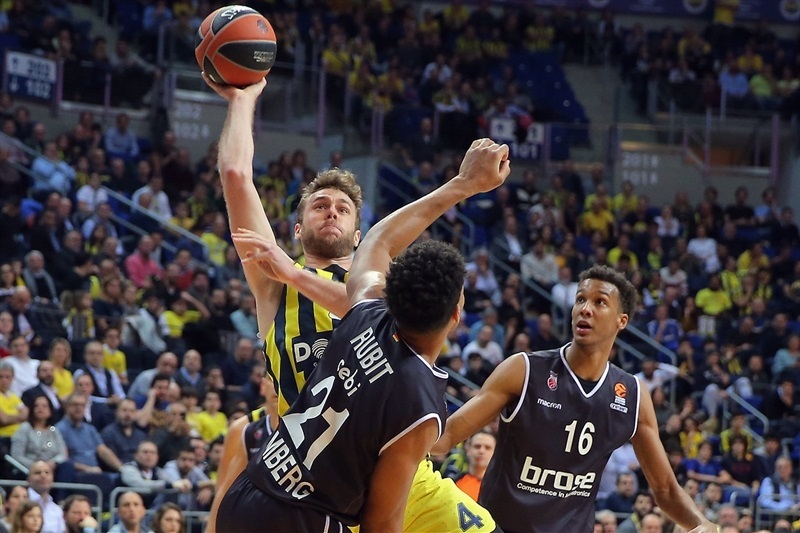 Vesely made sure of the victory then and there, with a put-back dunk and another to finished a break. 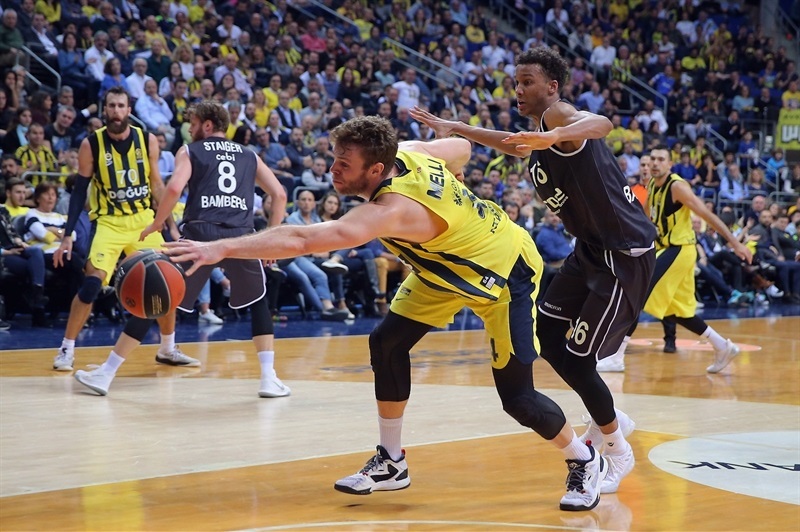 Datome's next shot made it 76-62 as Fenerbahce's defense held Bamberg scoreless for 3:30 when it mattered most to walk off with a home win. 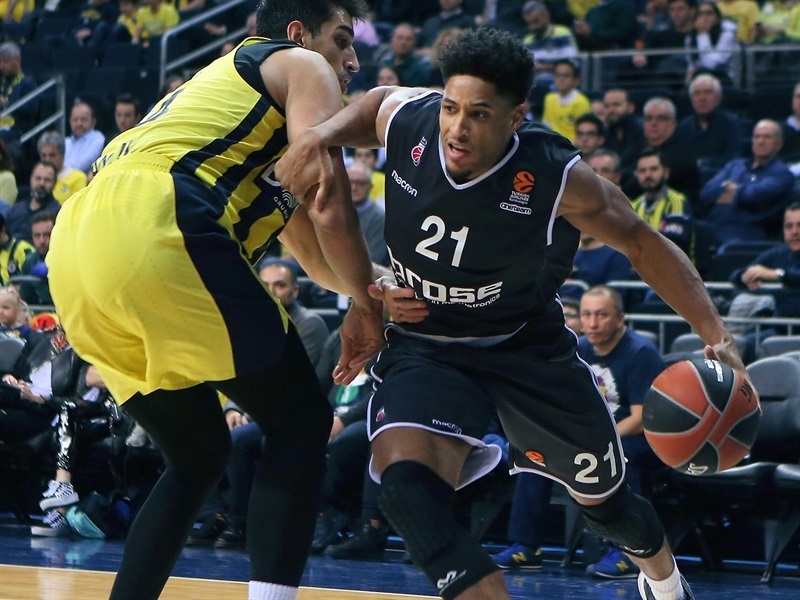 "We tried to prepare ourselves to the best possible way, thinking about how good Brose played its last game in the EuroLeague against Panathinaikos. Because they have some difference in their game if you compare with the game we played there in November. So we tried to really take care of it, but I believe that a lot of things could be improved. Like always, ups and downs. It's difficult to understand the many minutes we played relaxed and with no good decisions, and this I feel made the point difference lower. Brose is a team that always tries to fight until the end. They're a team that they try to change defenses, and in the first half we didn't handle their defensive changes, and because of this we had this kind of three-point percentage that is a disaster, 4 of 21. However, it was an important victory so I thank my players, and of course our fans for another very nice night in our gym." "We knew that it was a difficult team. We were playing against the championship team. We have our problems that make an already difficult season even more difficult. We came here to compete and stay mentally in the game. 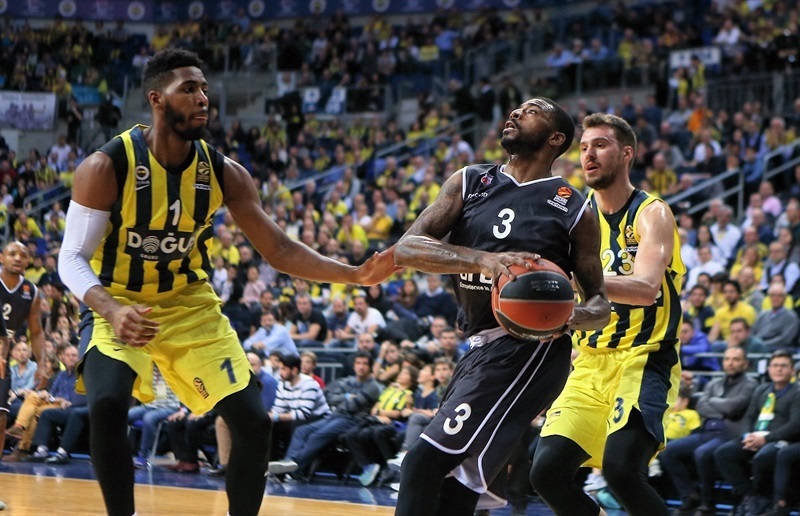 We used some kinds of defenses that normally we don't, but it was part of the plan to try to stay in the game and not allow Fener to have rhythm. We were lucky because Fener missed some open shots that could have totally changed the whole story. I believe we did a solid job to compete." "We wanted to keep on fighting and reacting after the very bad loss in Athens. I think we had good rhythm and energy throughout the game. I think we played good. We led all the game. Bamberg is a very well organized team with talent, so it was an important win for us, and we look ahead." 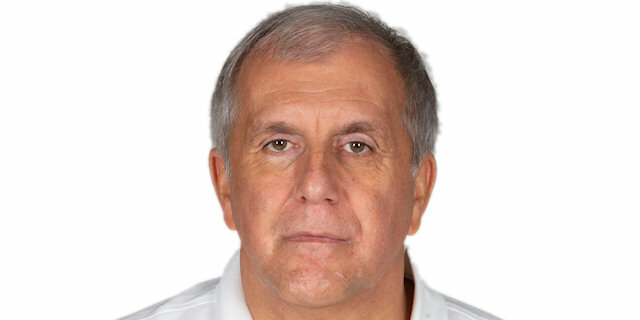 "We lost a very, very important game in Athens last week against Olympiacos. It was not easy, but we kept fighting, first on Sunday in the Turkish League against Efes, and we transferred that energy into today's game. It's a great team win. Everybody was fighting on both sides of the court, so I am grateful for this win and we have to keep going the same way." "I think Fenerbahce played smart, played physical. They are really long, they switch a lot of pick-and-rolls, so we never got a good flow on our offense. And on defense we let them get too many offensive rebounds, too many miscommunications I think, and that cost us the game."